Fab Faces: Face Painting, Balloon Twisting, with gear and party supplies for sale, NZ wide! Your first choice in entertainment and professional face painting and balloon twisting supplies! Face painting, balloon twisting and our fabulous range of party entertainment all add a youthful, fun touch to any event. We pride ourselves on being creative, friendly and professional and would love to help make your next party extra special! Our energetic and friendly team has lots of experience working with children and plenty of fabulous reviews so you can rest assured of a fantastic event when we're involved. 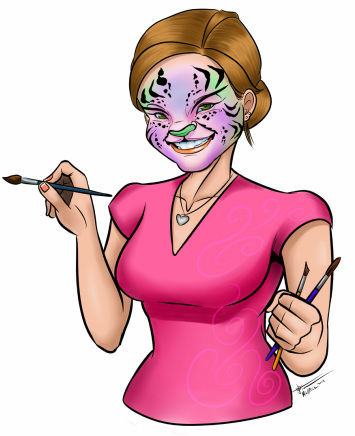 When it comes to face painting, we use only the highest quality, non-toxic, imported face paints (which we also sell if you'd like to try your hand at painting yourself). They're designed to look amazing, last the distance and are gentle enough to use on sensitive, young skin. Have a look in our galleries - the bright colours and fun designs speak for themselves. We can add further colour and excitement to your event with our fabulous balloon twisting and gorgeous glitter tattoos. All of our face painters are trained to twist balloons and apply glitter tattoos. If you're wanting balloon twisting to be a focal point for your event, we have amazing balloon specialists who are with us solely to impress with their twisting talent. Read more about the services we offer at both kids and adult events and to see how we can add excitement to your day. We have a talented team (of face painters, character entertainers and/or balloon twisters, depending on the centre) based in Auckland, Cambridge, Mt Maunganui, New Plymouth, Wellington & Christchurch and look forward to helping make your event memorable. Should you wish to have a go yourself, our party supplies, face paints and balloon twisting gear can be couriered anywhere in the country - everything that we use as professionals is available for you to purchase. Please get in touch with your inquiry or to make a booking. Fab Faces is pleased to have painted for the following companies, just to name a few. With so many happy clients, you can rest assured!